The Baratza Virtuoso is a quality automatic grinder aimed at home brewers, as well small-scale roasters and retailers that require a grinder suitable for light use. The Virtuoso features professional-grade 40mm conical burrs powered by a high torque DC motor and Baratza’s second generation (GB 2.0) gearbox. There are 40 available grind settings (from fine to coarse), which are capable of producing grinds from 200 to 1200 microns in size. The hopper holds 8oz (with the option to extend). The grinder is compact in size and has pulse functionality for grinding directly into a portafilter. For greater flexibility when making espresso, a portaholder can be purchased separately. This can be used in place of the grounds bin, allowing ground coffee to be dispensed directly into the portafilter. A hopper extender is also available, which adds a further 9oz to the capacity. For even more capacity, multiple extenders can be used. The Virtuoso is also compatible with Baratza’s Esatto accessory. This transforms the grinder into a real time, weight-based grinding machine. The Virtuoso is a handsome, compact black and silver grinder that’s easy to use, even for the novice home brewer. It comprises a top-fill 8oz bean hopper, a ring to adjust to one of the 40 separate grind settings, the grinding unit itself and a 5oz removable bin to capture the grounds. Aside from this, there is a side dial which controls the 60-second timer and a pulse button, which allows for the grinding to be controlled into ‘bursts’. This means you can use the Virtuoso to grind a large volume of beans at once, or a single ‘dose’. For espresso, there is the option to remove the grounds bin and replace it with a portaholder (not supplied) which makes it easier to dispense the right amount of coffee for a single or double shot. Under the hood, you’ll find the professional-quality conical burr grinders are driven by a powerful DC motor that is designed not to overheat (thus keeping the coffee beans cool). The Virtuoso is also fitted with speed reducers that slow its operation to 450RPM. This allows for an even bean feed, along with reduced noise, heat and static. The Virtuoso is by no means ‘whisper-quiet’ but it operates at a more than acceptable volume. It’s worth noting that the speed can be manually adjusted from 405 to 495 RPM, if required. So what can you do with the Virtuoso? Well, basically everything from espresso to French press. It’s worth noting that the finest setting on the Virtuoso still produces a degree of granularity in the grind, so all you lovers of Turkish coffee might feel a little short-changed! However, it works well for espresso (settings 2 to 6). Going up through the mid-size grinds, the Virtuoso produces the consistency needed for Aeropress (8 to 11), drip machines (13/14), V60 (13/14), pour-over (14), and Chemex (20/21) brewing. The upper settings produce the right consistency for French press. One concern is with the consistency of the grind at the upper end of the grind scale. The coarsest setting (40) is quite uneven, in terms of the size of the coffee particles. In light of this, when grinding for French press brewing, it’s worth taking the grind setting down to about the 30 to 32 range to ensure a more even surface area. If you do require a finer and more precise grind, a better choice of grinder is the aptly-named Preciso (also by Baratza). For a few dollars more (it retails around $285 to $300), you get the same 40 grind options, but each of these is further micro-adjustable into 11 distinct settings. This offers greater control that some users might demand. For regular home use, however, the Virtuoso will be more than adequate for the majority of brewers. As you might expect, in order to keep the professional-standard conical burr grinders operating to their optimal level and to promote a long-life for you Virtuoso, you will need to undertake some maintenance on the unit. The grounds bin is the easy part, as you can remove and clean it in hot soapy water after each use. This is important as the dispensed grounds can back up into the grinder, leading to problems. Similarly, you can wipe down the outside of the grinding unit with a soft cloth. To clean the bean hopper, make sure all the bean are removed before taking the hopper off the main unit. This can be a tricky exercise if the bean hopper happens to be quite full. The best tip is to only pour in the quantity of beans you want to grind. This makes cleaning out the hopper far easier (it also ensure the coffee retains optimal freshness). To clean the burrs, take off the silicon seal before removing the ring burr. Baratza recommends that, with daily use, the burrs should be cleaned at least every few months using tablets or with a stiff brush. While cleaning the unit – especially the burrs – sounds quite onerous, it is important; not least to ensure the coffee oils are removed, as this can negatively impact on the flavor of freshly ground coffee. Overall, there’s really not much about the Virtuoso to dislike. The big selling point is the commercial-grade conical burr grinders that do a fine job in producing a largely consistent grind that’s more than adequate for the vast majority of home coffee lovers who want to get the most out their beans. To find fault with the Virtuosos means digging deeper and questioning the control (or lack thereof) in respect of making adjustments beyond the 40 grind settings. If having a grinder able to handle 40 grind settings is enough for you, it’s likely you’ll get on just fine with the Virtuoso. If you need (or want) even more control, you might be better looking for a different grinder that come with additional control functionality. This also applies if you need to grind down to sand-like consistency, which is outside the scope of the Virtuoso. Pros: The Virtuoso features quality burr grinders driven by a powerful DC motor with a controlled 450RPM speed, offering (for the most part) a consistent and even grind. The Virtuoso is easy to use, nice-looking and well-designed. The 40 grind options bring versatility within reach of the home brewer at a reasonable price. The unit may also be an attractive option for the small/micro-roaster or coffee shop needing a secondary or back-up grinder for cuppings or grinding customers’ beans to order. Cons: There are some issues with messy grounds and maintenance. Some users have also reported the unit heating up when they operate the 60-second timer. The Virtuoso is fine for regular use, but not designed for heavy/commercial-scale grinding. There have even been a few third-party reports questioning its durability. The Virtuoso is fine for most homebrewers’ needs (drip, French press etc. ), but doesn’t grind fine enough for Turkish coffee. In a sentence? 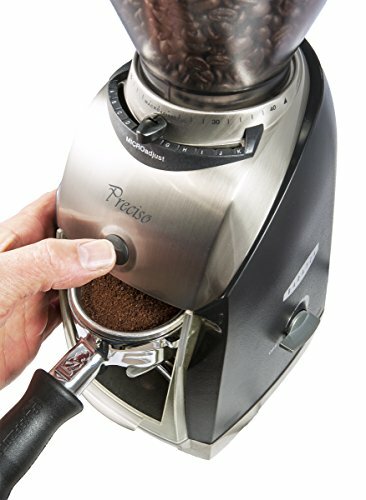 The Virtuoso is good option for anyone looking to take their home grinding (or light commercial grinding) to the next level at a reasonable cost – however, it offers less versatility and control than some other ‘domestic’ grinders on the market (including Baratza’s own Preciso model).